With one of the largest collection of baker racks available anywhere, you are sure to find a rack that fits your home and space requirements. 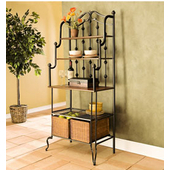 We offer bakers racks in a wide variety of styles and finishes, ranging from wrought iron to wood. All of our racks come standard with a plethora of storage or display space. Some models feature cabinets in addition to shelving. 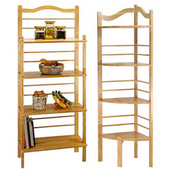 Corner bakers racks are also a great alternative to the traditional rack. Should you have any questions while browsing our collection, please feel free to call us toll free. An expert sales team is waiting to answer any questions you may have. Elegantly crafted, these bakers racks by Hillsdale Furniture are ideal additions to your kitchen or dining room and provide an attractive storage solution. 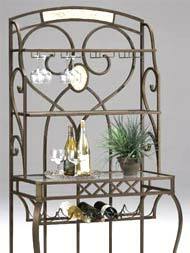 Choose from bakers racks with built-in wine and stemware racks, bakers racks with open and closed storage areas with glass or wooden counter space ideal for serving or displaying. Constructed from sturdy tubular steel.